Northeast Regional Council of Carpenters' Local 290 senior council representative and team leader Anthony Macagnone was recently honored by Outreach, a New York-based drug and alcohol treatment services provider, for his continued efforts to support the program on Long Island. Macagnone, who also serves as a councilman in Oyster Bay, received an award from Outreach at an annual luncheon at the Stonebridge Country Club in Smithtown. "I feel great about it … I still want to do more," Macagnone said. His interest in Outreach is rooted in a visit he paid several years ago to one of the provider's recovery centers in Brentwood. Since then, he has made it a priority to raise awareness for the center and its ongoing efforts in the community. "I toured the place a couple of years ago and I saw the kind of work they did and I wanted to help in any way possible," Macagnone said. Outreach, which aims to support those struggling with the effects and consequences of drug and alcohol addiction, says it plans to create more residential treatment locations over the next few years as a result of a major capital improvement plan. All planned projects will feature union labor. The organization also provides residential, outpatient and training services for adults and adolescents at locations in Brooklyn and Queens and an additional site on Long Island. 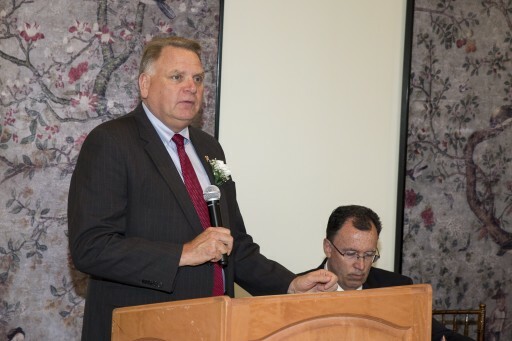 In addition to Macagnone, Outreach also honored Jeffrey A. Getzel CPA, CFF, managing partner of Getzel Schiff & Pesce LLP, and Thomas Lane, Outreach Board Member and retired president of the Tile, Marble and Terrazzo B.A.C. Local Union 7. "We are grateful for the continuing support of Anthony and his colleagues in the Long Island business, union and labor communities who have been tremendously supportive in this time of crisis," said Kathleen Riddle, President/CEO of Outreach. "With the spotlight on the increase in opioid abuse and addiction, their continuing efforts to help us expand awareness and treatment to more people deserve the heartfelt appreciation of all Long Islanders." Macagnone says that just from listening to some of the personal stories from kids at the center, it's not hard to imagine that "it could be my kid or your kid." "Just the way they work with these kids to get them back on track was simply amazing, and we just wanted to help," Macagnone said. The Northeast Regional Council of Carpenters (NRCC) represents nearly 40,000 hard-working men and women in Delaware and New Jersey and portions of Maryland, New York, and Pennsylvania. NRCC is one of the largest trade unions on the East Coast. The NRCC equips professional men and women carpenters with the skills, training and quality workmanship that are demanded in today's construction industry. For more information on NRCC, please visit our website: www.northeastcarpenters.org; Facebook: https://www.facebook.com/NortheastRegionalCouncilofCarpenters; or Twitter: https://twitter.com/nrccarpenters.